Fractional laser treatment is a non-invasive treatment that uses a device to deliver a laser beam divided into thousands of microscopic treatment zones that target a fraction of the skin at a time. 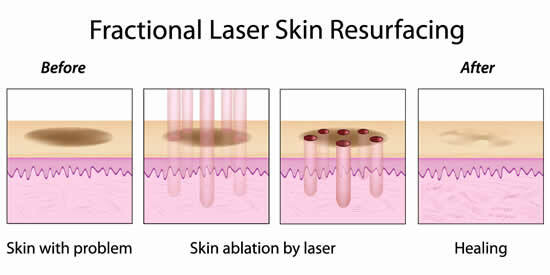 Recovery period is similar to recovering from any other laser treatment procedure. After the treatment the skin may get swollen and feel sunburned. You can use ice packs to cool the area and take the medicines as prescribed. The skin begins to heal after a few days. It is advised to moisturize your skin after treatment and avoid sun exposure. When are the results of the procedure visible ? Results can be seen immediately after the treatment and they get better over time. The skin heals and peels gradually over time and formation of new collagen is stimulated, thereby, filling wrinkles and fine lines and reducing and elimination skin discolorations.